In 2014, BJP got 42% vote share in UP while SP stopped short at 22% of the votes to win five seats and BSP has failed to win any seats despite getting nearly 20% of the votes. The alliance is expected to pose a tough challenge to the BJP which had got 73 of the 80 seats in an alliance with Apna Dal in UP in 2014. 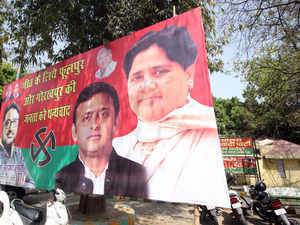 NEW DELHI: Aiming for half the vote share in Uttar Pradesh through a consolidation of Scheduled Caste, Yadav and Muslim voters, Bahujan Samajwadi Party (BSP) chief Mayawati and Samajwadi Party (SP) president Akhilesh Yadav will announce an alliance on Saturday between both the parties to fight the 2019 Lok Sabha polls. The alliance is expected to pose a tough challenge to the BJP which had got 73 of the 80 seats in an alliance with Apna Dal in UP in 2014, which paved the way for Narendra Modi to become the Prime Minister with a clear majority. The Congress will stay out of the SP-BSP alliance while Ajit Singh’s RLD is expected to be part of the group. SP and BSP leaders will be on the same stage on Saturday to announce their coming together after a bitter rivalry over the past 25 years. “We have now got the arithmetic right, and have found the glue, as we saw in the Lok Sabha bypoll wins in Gorakhpur and Phulpur. The (SPBSP) alliance will be announced on Saturday,” Akhilesh Yadav said in Kannauj on Friday. “Our combined vote share was same as BJP. We aim now for a 50% vote share in the alliance, given that there are 10-11% Yadavs, 18% Muslims, and about 21% SC voters in UP. Also, OBCs who voted in big way for the BJP in UP in 2017 are disillusioned with the party, given their surprise choice of Chief Minister in a Thakur leader, Yogi Adityanath,” a senior SP functionary, who is close to the alliance talks, told ET. The SP-BSP announcement will be made on Saturday and an invite for the same was made public on Friday to coincide with BJP’s two-day National Convention in Delhi. Mayawati is expected to position herself nationally now as a pivot for an anti-BJP alliance, with Akhilesh Yadav supporting her case for a national role, sources said. Yadav laid out a case for an SP government in the state on Friday, indicating that he was interested only in the CM’s role. Mayawati, meanwhile, will be celebrating her birthday on January 15 both in Lucknow and Delhi, with leaders of her other allies such as JD (S), INLD and Ajit Jogi’s Janta Congress being invited for the Delhi function. BSP and SP could fight 37 seats apiece but not field candidates on the Gandhi-bastion seats of Rae Bareli and Amethi. A “strong candidate” will be put up by the alliance from Varanasi to take on Prime Minister Narendra Modi. RLD had been offered 2-3 seats by the alliance and one to Nishad Party but Ajit Singh is said to have demanded at least five seats. “We are a part of the alliance but there have been no talks on seat-sharing so far. We will make our demand when seats are discussed. I have no information on the press conference called by Mayawati and Akhilesh,” RLD’s Ajit Singh said on Friday. Mayawati and Yadav had discussed the contours of the alliance at a meeting in Delhi on January 4 while RLD’s Jayant Chaudhary had met Yadav in Lucknow earlier this week. BJP’s deputy chief minister in UP Keshav Prasad Maurya said the alliance will not pose any challenge to the party as the 2019 elections are being fought in the name of Modi. “This election will be to elect Narendra Modi as Prime Minister again and give the country a strong government -- people will not vote for the SP-BSP which can only contribute to a weak government,” Maurya explained. BJP’s state president Mahendra Nath Pandey asked whether SP-BSP will first issue a public apology for the attacks they have made on each other in the past 25 years. “They are no challenge to us -- in fact, the alliance shows we are the real challenge to them and they are desperate,” said Pandey.